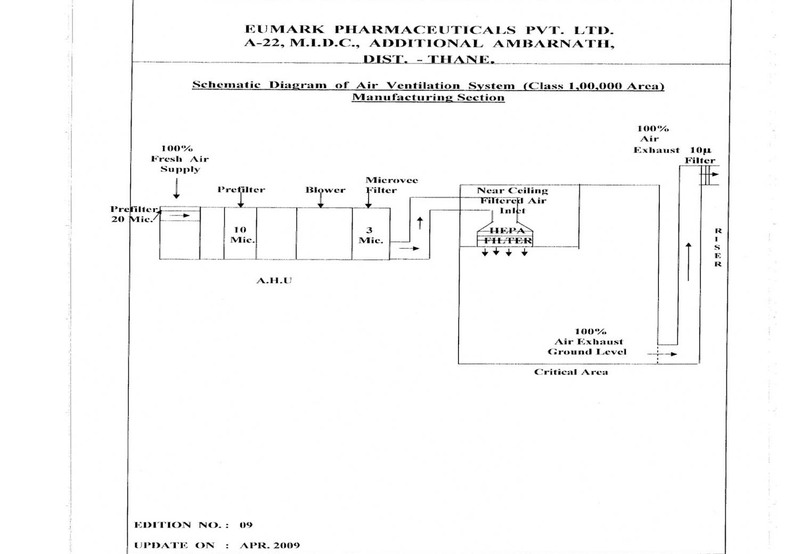 Area provided with AHU having 10 μ pre-filter and 3 μ Post ,Plenum- filters with Terminal HEPA filters with Air Conditioning,Class 1.0 Lakh area and LAF Unit with HEPA filter to provide Class 100 working area. Air changes : 40 - 60 / hr. Positive pressure : 1.00-2.00 mm WC. Room maintained at Class 1.0 Lakh area with Air Conditioning, with Reverse LAF Unit with HEPA filter to provide Class 100 working Area. Air changes : 40 - 45 / hr. Positive pressure : 1-1.5 mm WC. Room maintained at Class 1 Lakh area with Air Conditioning, with Reverse LAF Unit with HEPA filter to provide Class 100 Area. Air changes : 40 - 45 / hr. Positive pressure : 1.0-2.0 mm WC. Magnehelic gauges are fixed to measure pressure differences in RLAF Units of Sampling and Dispensing Sections. Hygrometers are provided in Sampling and Dispensing Sections for constant monitoring of % Relative Humidity. Area Validation Frequency for Micro, Sampling & Dispensing for Particle count, Air Velocity :Twice in a Year by outside party PAO Test : Once in a Year. Air Handling Unit with High Integrity 10 μ pre-filter & 3 μ Post Plenum filter & filtered through Terminal HEPA filter. 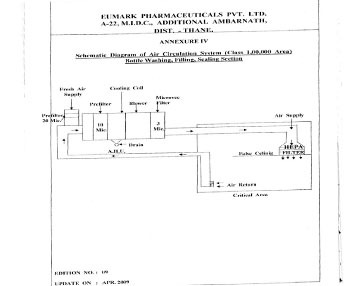 100% fresh Air is sucked from atmosphere and filtered through 10 μ Plenum pre-filter & 3 μ Plenum Post filter and fed through Terminal HEPA filter to the Department. 100% used Air from Mfg. Section is exhausted to atmosphere from ground level through risers through 10 micron filter. Since 100% fresh Air is fed to Mfg. Dept. and 100% used Air is exhausted every 60 seconds. Area maintained at Class 1.0 Lakh standard, validated periodically for particle count and Air changes TWICE A YEAR by outside party. Air changes :40- 60/hr. Positive pressure Over adjust cent Areas : NLT 3 mm WC. NO AIR IS RETURNED TO DEPT. HENCE NO CHANCES OF CROSS CONTAMINATION WITH DEPT. AIR BY PREVIOUS PRODUCT TRACES. AHU with High Integrity 10 μ pre-filter & 3 μ Post Plenum filter & filtered through Terminal HEPA filter with Air Conditioning. Area maintained at Class 1.0 Lakh Standard. Return filtered & cooled Air is again filtered through 10 μ & 3 μ filters & Terminal HEPA with 20% fresh Air. Since the activity is Bottle Washing and Liquid Filling, no chances of particles generation within the Dept. for the returned Air. Air changes : 30 - 50 / hr. Positive pressure : 1-1.5 mm WC. Area validated for particle count and Air changes : TWICE A YEAR by outside party. All 10 μ filters are cleaned Once a Week and 3 μ filters Once a Month. 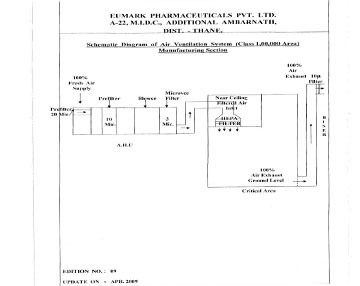 Positive pressure is monitored through Magnehelic manometers. Separate AHU provided with 10 μ filter with Forced Draft Air ventilation through passage and ventilated through powerful exhaust on the other end of the rooms. Are provided with Split Air Conditioners of required capacity to maintain comfortable working conditions and Material storage conditions. 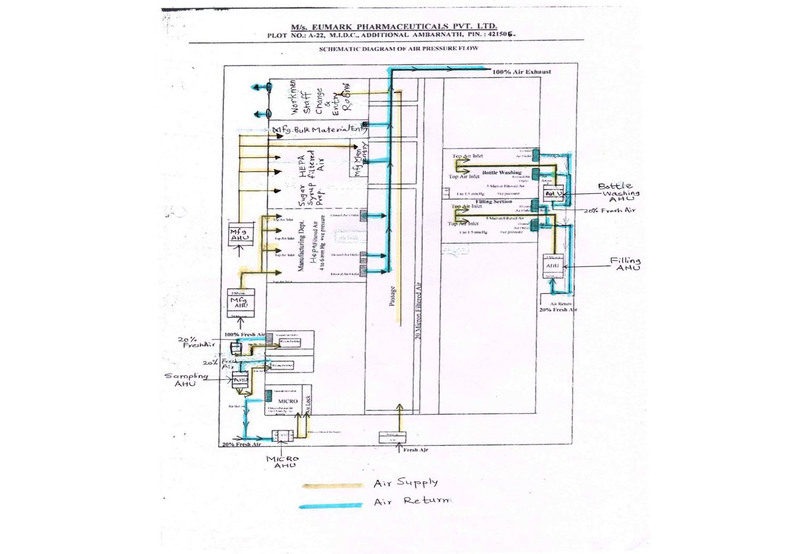 Schematic Diagrams of HVAC Systems enclosed. 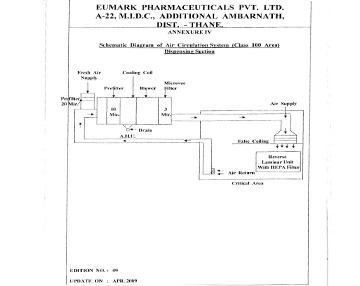 Schematic Diagram of HVAC Dispensing Section Class 100. Schematic Diagram of HVAC Class 100000. 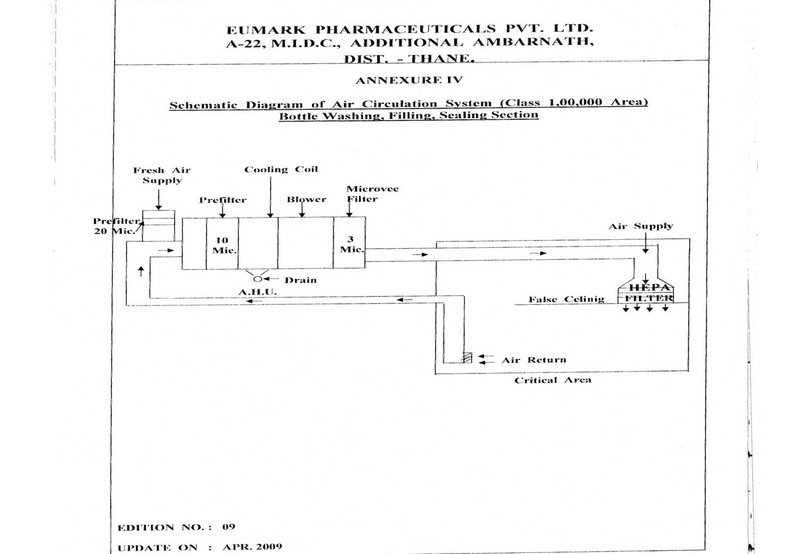 Schematic Diagram of HVAC Bottle Washing & Filling, Sealing Sections Class 100000. 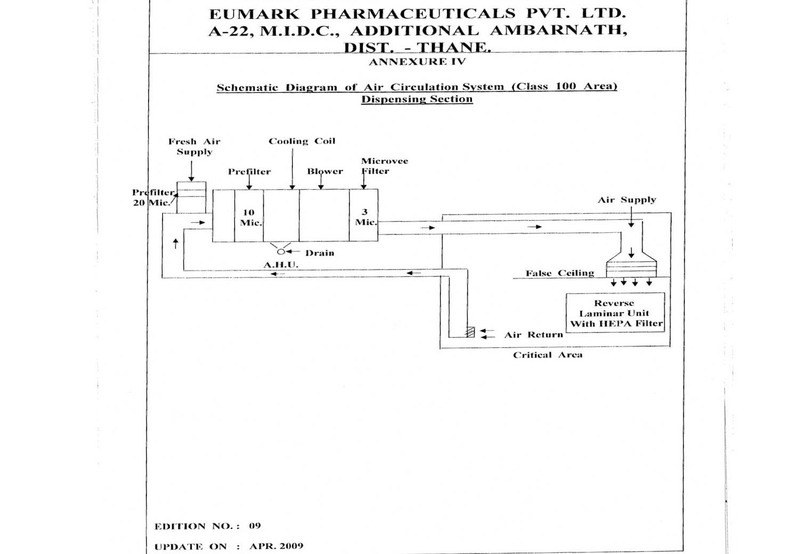 Schematic Diagram of HVAC Air Pressure Flow.